A New Heart Disease Detector? Mammogram images can detect calcifications in breast arteries that may indicate an increased chance of developing heart disease, according to the Mayo Clinic study of 1,803 women. Women with breast-artery calcifications were 20 percent more likely to have heart disease than those without calcifications, the researchers found. The abnormalities show up as distinct white lines on mammogram images and should not be confused with other types of breast calcifications that may be insignificant or, in some cases, malignant, the researchers said. "Pretty much every radiologist can tell the difference; it's not a difficult distinction," said lead author Dr. Kirk Doerger, a Mayo Clinic radiology resident. Still, radiologists generally are thinking cancer - not heart disease - when they analyze mammograms. 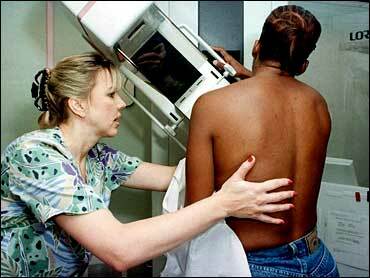 "The reason why mammograms are done is for cancer detection. This is just an extra piece of information that could help discover women who are at increased risk of having narrowing in the arteries supplying their heart," Doerger said. His research was to be presented Wednesday in Chicago at the Radiological Society of North America's annual meeting. More than 350,000 U.S. women die of heart disease each year, compared with about 40,000 who die from breast cancer. Yet many women believe breast cancer is a greater risk and may not know they have heart disease, underscoring the need for better detection methods, the researchers said. They reviewed mammograms for patients who'd also undergone angiograms - imaging tests to detect heart disease - at the Mayo Clinic from 1991 to 2001. Participants were aged 65 on average and already at increased risk for heart disease based on their age. The calcifications detected are calcium deposits that may form in diseased arteries narrowed by fatty plaque. Heart and breast arteries are of similar size and are thought to respond similarly to factors such as high cholesterol, Doerger said. The risk from calcifications is not as strong as conventional factors linked to heart disease, such as high blood pressure and elevated cholesterol, but it should not be ignored, Doerger said. He said such calcifications should be noted in radiologists' mammogram reports and that afflicted women should be referred to their regular doctors for further assessment. "This is quite a dramatic observation," said Dr. Linda Warren Burhenne, a mammography specialist in Vancouver, Canada. "The literature is quite sparse in this field." Burhenne said radiologists frequently see such calcifications, which often show up as skinny parallel lines where calcifications have formed inside artery walls. "Unless it's really dramatic, we just don't pay attention to it ... because it has not been determined to be of any importance" until now, she said. "It kind of makes sense to think that if there's calcification in the breast arteries there might be calcification in the other arteries," said Dr. Gene Solmos, a mammogram specialist at Chicago's Rush-Presbyterian-St. Luke's Medical Center. "It's a very interesting concept and it may pan out," Solmos said. Dr. Robert Bonow, president of the American Heart Association, called the results intriguing but preliminary. The women studied were already at high risk for heart disease. Whether breast-artery calcifications in lower-risk women would be meaningful remains to be seen, Bonow said. Still, he said the findings could potentially be significant because so many women die of heart disease, and because mammograms are so routine. "Here's a test many women are having anyway for screening for breast cancer," he said. "If this holds true, it could be an important additional piece of information."